Think back to the last time you purchased a new vehicle. Do you recall advising the salesperson, in that gently chiding tone of yours, to be sure not to show you any cars manufactured on a Monday or a Friday? When the incredulous salesperson asked you why the day of manufacture would possibly matter, do you recall your explanation? "We all know that assembly line workers are, like everyone else, tired on Monday mornings so quality suffers until the workers regain their rhythm. And we all know that many assembly line workers start their weekend on Thursday night and come into work on Friday morning tired and hungover, and with everyone else so focused on starting their weekend, quality suffers all day long." This is, of course, a preposterous notion. Automobile manufacturers embed so many quality controls and redundancies into the manufacturing operations that they feel quite comfortable issuing a brand promise of high manufacturing quality, regardless of which worker, which shift, which factory, which country, was involved in the assembly of a given vehicle. Sure, mistakes can happen, but the incidences are statistically remote and any observable pattern of recurring flaws would be dealt with quickly and effectively. And yet every single day in-house counsel across the globe feel the need to instruct their outside lawyers to not allow first- or second-year associates to work on certain matters, or on all of their matters, in order to protect the integrity, quality and efficiency of the legal work product. What gives them the right to meddle in the production of the legal work? What factors influence clients to analyze legal bills, highlighting some tasks as unnecessary and accordingly refusing to pay for services rendered? The answer, quite simply, is the typically insufficient and ineffective law firm brand promise. Once, while serving as moderator of a panel of law firm managing partners presenting at an in-house counsel conference, I asked how each law firm demonstrated "quality" to its clients. One managing partner declared that his approach was to hire the best and the brightest, pay an above-average wage, staff matters to ensure thoroughness and leave no stone unturned in the pursuit of the client's objectives. An audience member asked the managing partner if he wasn't even a little concerned that clients, the questioner included, weren't willing to pay premium prices for young lawyers to learn their craft. The managing partner scoffed at the notion, suggesting that if the client wants quality, he should expect to pay for it. Let's all sit quietly for a moment and let that, shall we say, inelegant response settle in. Before you judge the managing partner too harshly, understand that nearly every law firm partner felt this way just a few years ago. Hire quality people, train them at the knee of quality partners, continue the tradition of quality that Smith & Jones has delivered lo these many years, rinse and repeat. The only oddity was this managing partner's tone deafness in the face of monumental market changes, but his perspective is by no means unique. The fact is, law school doesn't train lawyers to practice. (If you aren't prepared to stipulate this point, then you needn't continue reading.) Furthermore, academic success, as typically measured by the LSAT, law school grades and bar exam performance, have limited utility in predicting a lawyer's ability to understand a client business, have empathy, employ active listening skills, ensure predictability, use project management, deploy resources efficiently, embrace technology, create and adhere to budgets, communicate proactively and be responsive -- the very factors clients use to measure law firm performance. Simply hiring good people isn't enough, not nearly enough, to demonstrate quality. I like wine. I don't know much about it, but I enjoy a fine red or a chilled white when the occasion arises. And like many unsophisticated wine buyers, when I'm invited to a dinner party and I need to select a bottle to bring, I migrate to the expensive aisles at my local wine merchant. After all, I can't arrive at a fancy party with a $25 bottle of wine when a $75 bottle of wine would be far more suitable, right?! The oenophiles reading this are chuckling. (Oenophile is the Greek word for wine snob!) Anyone who knows wine knows that price is a lousy proxy for quality. There are many excellent wines at affordable prices that, by comparison, make the expensive wines taste like aged vinegar. Yet this is the same approach many firms take to demonstrate quality: "We're expensive because we're good; and we're good because we're expensive. Don't hire that inexpensive middle-market middle America firm, hire us at two times the rate, because you will get two times the quality." Incorporating metrics in the selection and management of outside counsel is exactly why we see the increased presence of the procurement function in many law departments. A law department can create a dashboard of measurable factors and each outside law firm must fall within acceptable boundaries or be shown the door. Many partners perceive the market changes as purely a reaction to price -- whether in the form of clients simply demanding lower rates, or in the form of competitors offering predatory pricing to steal clients away. The reality is, many law firms have created their own dashboards of measurable performance cues, and these form the basis of their pricing and operational strategy. Law Firm A may be able to provide a service on a fixed fee basis, or within certain boundaries on an hourly basis, by closely scrutinizing the manner in which it delivers its services and still generate a handsome profit while finding efficiencies. But Law Firm B, which treats all matters as the same regardless of the client's perceived value, can only offer discounts which erodes profitability and does nothing to improve the quality of the work product or the client's perception of value. And every day the partners of Law Firm B will cry that their competitors are "undercutting the price and winning work that can't possibly be profitable." 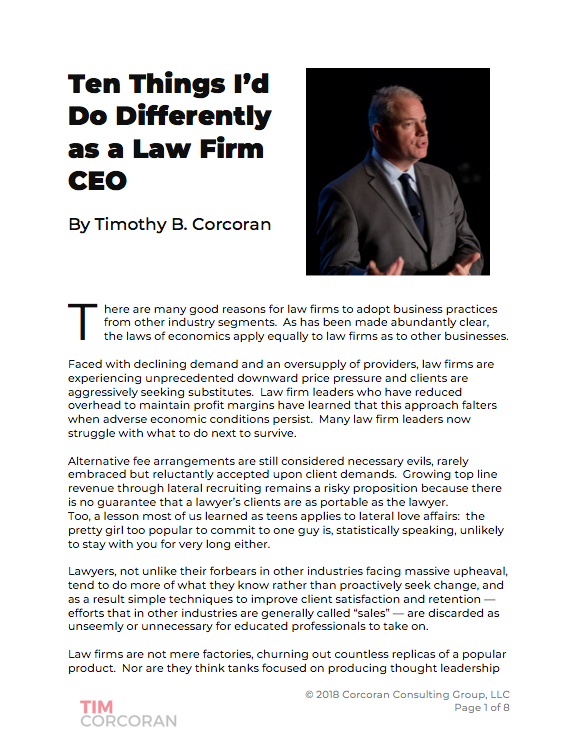 The only thing holding back Law Firm B from embracing a more modern business-oriented approach to the practice is the short-sightedness of its leaders and the recalcitrant posture of its partners. Clients can go too far, but can you blame them? In a recent workshop, an in-house lawyer explained that she bans first- and second-year associates from all of her company's matters because she fears that any inefficiency will be passed on to her, often in a disguised fashion. "I'll pay partner rates for their experience, but I won't pay the lower associates rates when the 'rates times too many hours' calculation always works in the law firm's favor." She went on to say that she also demands her outside counsel provide profitability information so she can "ensure that the law firm is making a fair profit, but too much of a profit, from the work I send them." Partners, hold on to your chairs, I've got this one. If Law Firm A in our example above can deliver a quality work product, using the client's own metrics, at a reasonable rate, using the client's own perception of value, then the client has no business meddling in how the law firm produces the work. Like the auto buyer, the brand promise of quality is built into the many measurable performance attributes. A client who continues to meddle under these circumstances is misguided. And, let's be crystal clear, no matter how idiotic it is for law firm leaders to perpetuate the profitability rankings, and how meaningless profit is as a measure of quality, no client has any business dictating the profit margin a law firm can make. Any General Counsel who disagrees with me on this point should schedule five minutes with his or her own CEO or CFO and ask how often these business leaders allow their clientele to have direct input into transactional or long-run profit margins. I get the underlying intent, but clients should focus on the performance metrics that matter, hire law firms that meet these performance criteria, and leave the production and profitability to the law firms to decide and derive.